What came first, the Conservatory or the Orangery? Because the chicken and the egg are so 2017. Officially, the orangery came first, originating from the European Renaissance. In the 15th and 16th century, Italian nobility used Roman inspired architecture to grow, of course, citrus fruit. A couple hundred years later, conservatories were introduced in northern European countries, as people began to realise that conservatories meant exotic fruits could be grown in cooler European climates. 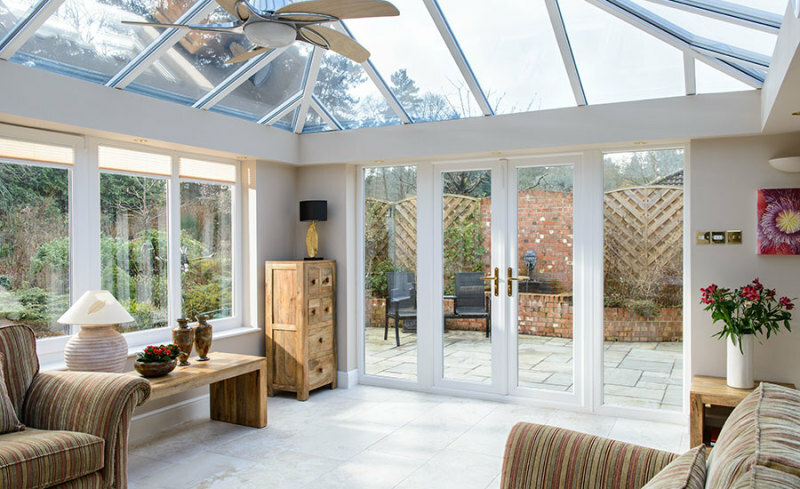 What defines a Conservatory or Orangery? The most common consensus on the difference between a conservatory and orangery is to do with the amount of glazing. While a conservatory consists of around 80% glass or more, an orangery is built with less glass, and more solid materials. An orangery is predominantly made from timber or brick, with a roof lantern, and large panes of glass surrounding the outside. In most cases, an orangery’s general style and render will match the rest of the house, in order to appear as though they’re an extension of the property. In the case of a conservatory, while it can be in keeping with the style of the house, it feels more like an add-on. You could say, an orangery is a cross between a conservatory and a traditional extension. The roof lantern and solid materials used in an orangery provide better insulation than a conservatory, which means you can happily use an orangery all year round, and not worry about burning through those heating bills. Regardless, when fitting your build, you should choose a high performance glass for better insulation. Orangeries have a more consistent temperature than conservatories. Often conservatories can feel like the Arctic in the winter, and the Sahara in the summer. As they are closer to a traditional extension than conservatories are, orangeries generally add more value to your house than a conservatory. Due to the difference in glazing, conservatories have the ability to let in more natural light than orangeries. This also means that they provide a better view of the garden. You don’t need to break the bank when building a conservatory. For the most basic option, you just need some glass, uPVC, a couple of chairs and a table. Before making the decision, it’s important to consider why you want the extra space, and how you’ll use it. Are you yearning for a better view of the garden, or are you looking to install a new kitchen? Your budget should also be a consideration. You could spend £5,000 on a basic uPVC built conservatory, and anywhere from £15,000-£45,000 on an orangery. However, it’s worth noting that cheap looking conservatories can be off putting to potential buyers. Are you selling your home or continuing to live in it? Orangeries tend to add more value (so are worth the big bucks), but adding value should not be your only consideration. Think about what will improve your lifestyle. Finally, it depends on your personal style. Orangeries can add a touch of elegance to your home, whereas conservatories are great for housing plants and enhancing that ‘jungle’ feel.